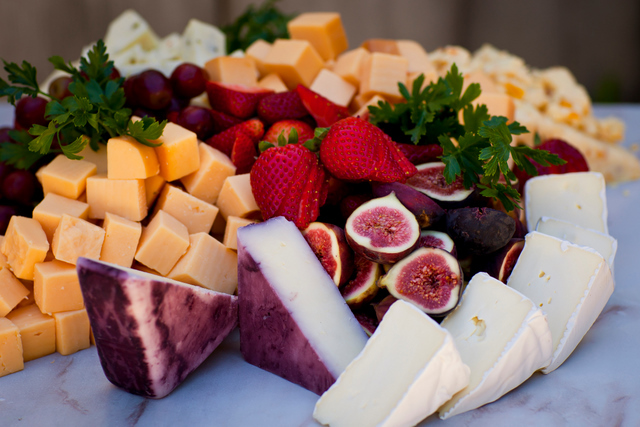 It’s about the beauty & bounty of the spread. 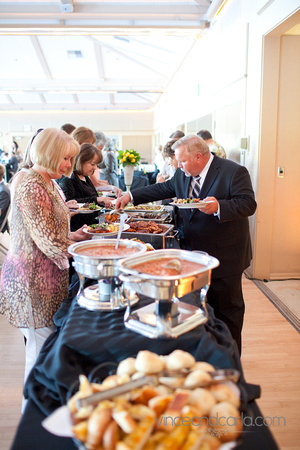 Many brides shy away from buffets over the fear of lines & and a long row of stainless steel chafing dishes. 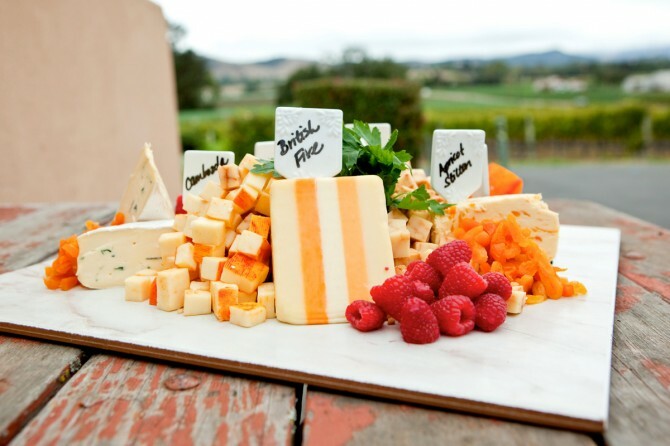 This lovely wedding at Edna Valley Vineyards shows how buffets can be exactly the opposite! 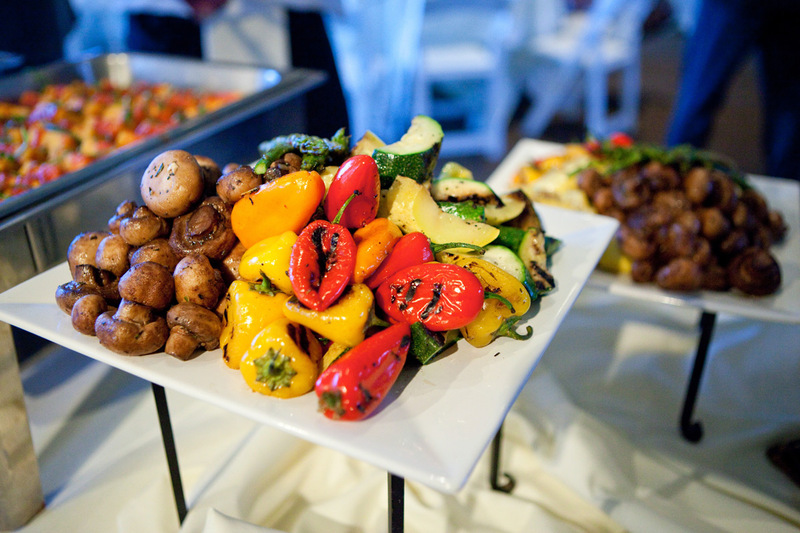 Buffets can be a way to add color & a bit of fun to a reception. 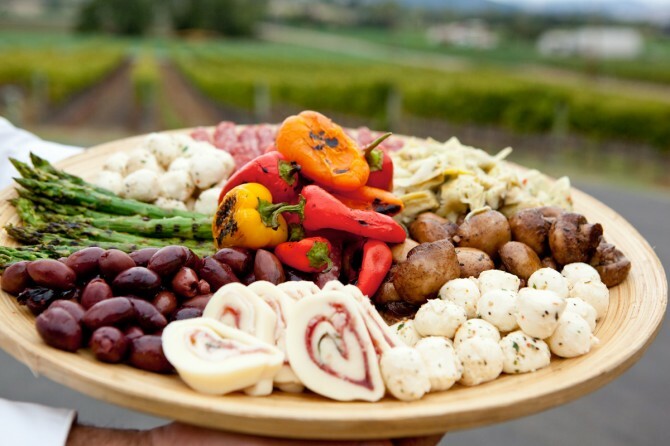 It’s also a way to showcase the amazing Central Coast grown produce & specialties. This menu for Erin & Brad’s wedding was served in the autumn when some local produce is at it’s peak including heirloom tomatoes from Peacock Farms and mushrooms & squash picked up that day from the Templeton Farmers Market. Other menu items included oak-grilled tri tip with chili & orange salsa and grilled corn cakes with roasted tomato & rosemary chutney. 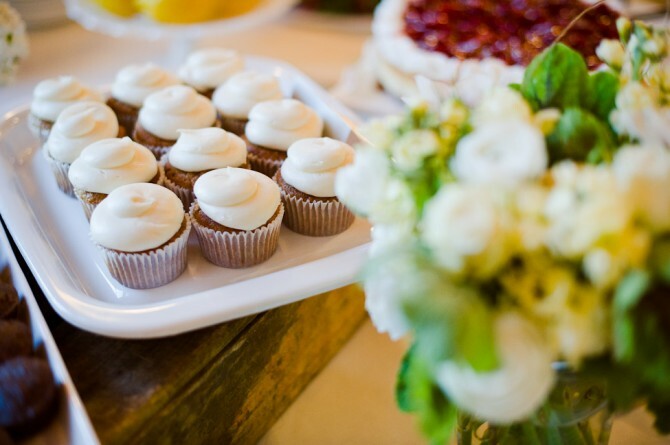 Thanks to the amazing wedding photographer Amy Wellenkamp for taking a moment to capture our cuisine! 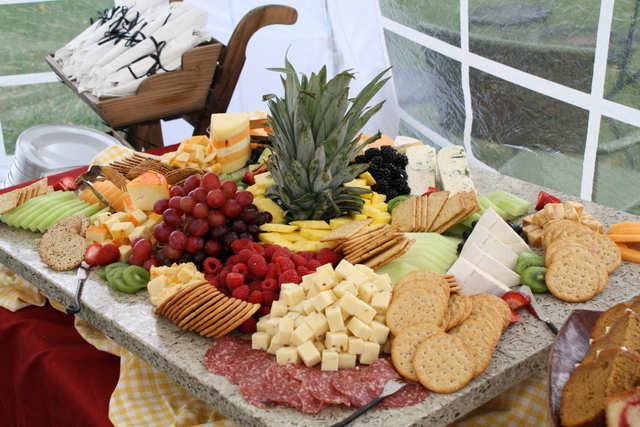 Below are a few of the yummy appetizers. Can you see the heart? 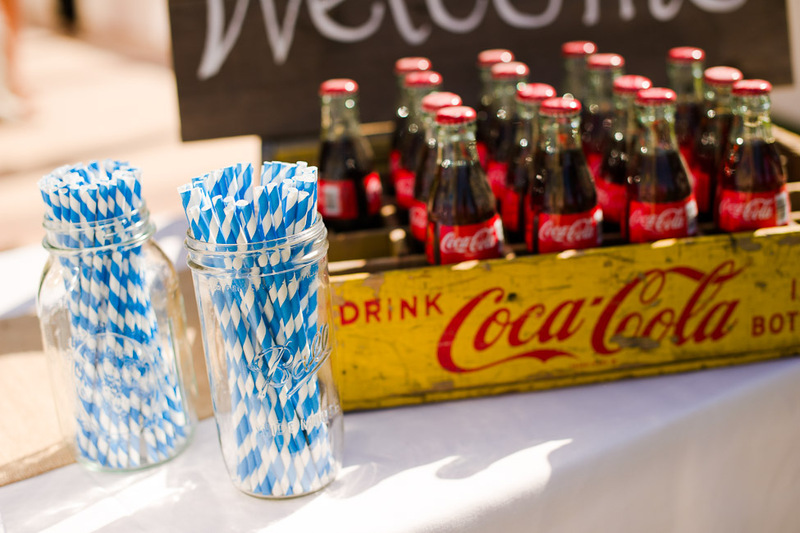 And congrats to Erin & Brad–Thanks for letting the crew of Pacific Harvest Catering be a part of your special day! 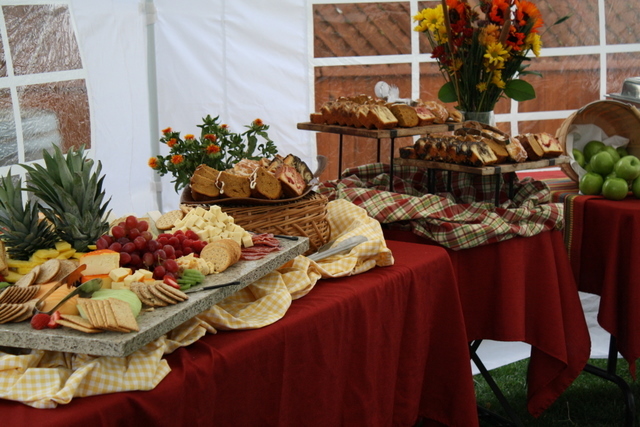 We are delighted each fall that Pomar Junction Vineyard & Winery has us out to cater their Annual Harvest Brunch. 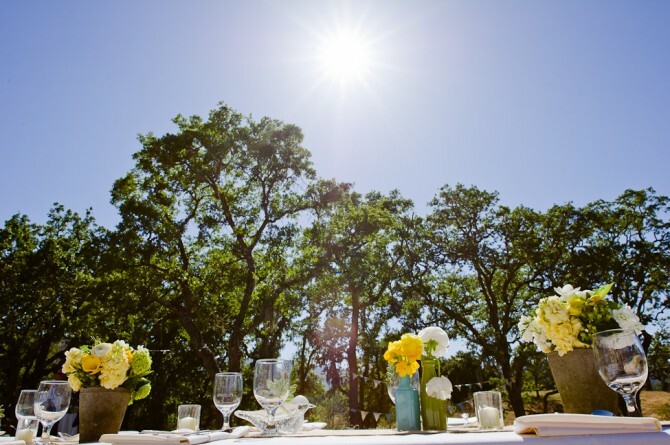 The Templeton winery is family-owned, has charming grounds & gardens, & has awesome wine! 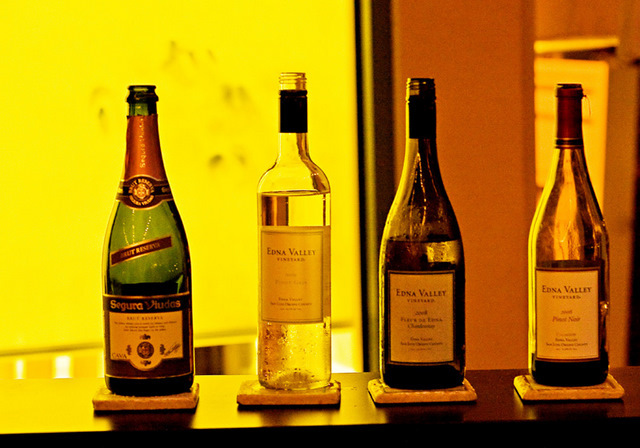 Great wine is an ideal compliment to our food which is one of the many reasons we love working there. 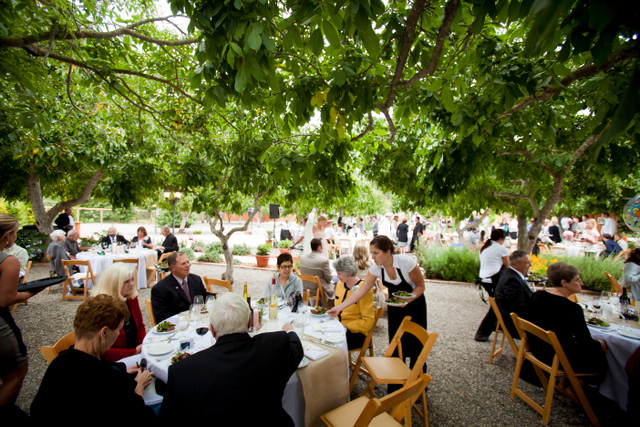 And it’s one of the reasons we love being in the culinary field, as we are minutes from artisan farms & vineyards. This year, the lucky guests were treated to a warm tropical storm (thus the white tents) but the occasional thunder & lightening really made it an amazing experience to remember. Yum, spiced pumpkin bread, anyone? Have we mentioned that we love working at the Gardens at Peacock Farms? No, they don’t have a great setup for easy catering or even a kitchen for us to use (we build our own). But this Arroyo Grande event venue is amazing! And the proprietors Logan & Jessica keep the grounds impeccable. 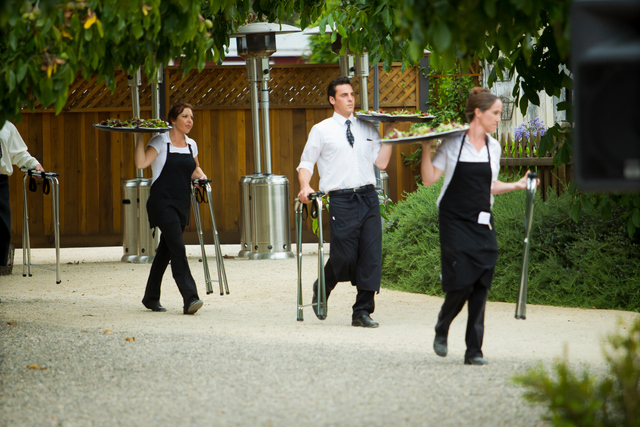 They create a perfct ambience for weddings with their thriving gardens, winding pathways & overhanging canopy of fruit trees. 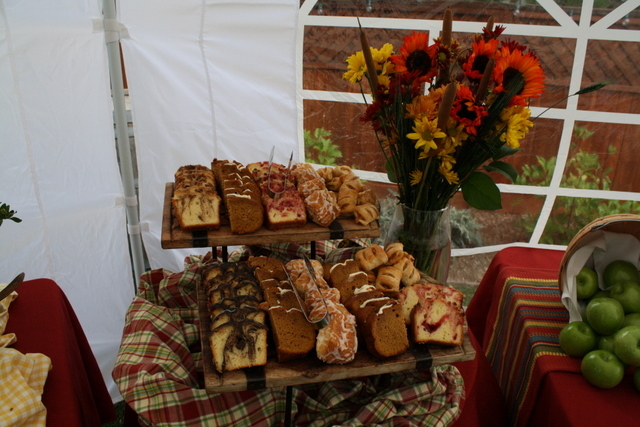 Here’sa few pics from a wedding we catered there recently. 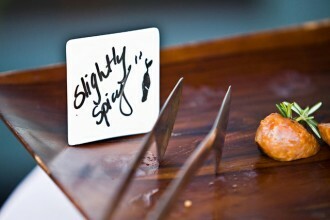 Lucky for us, Jayson Mellom snuck back to our kitchen area to get some shots of the plated dinner service. 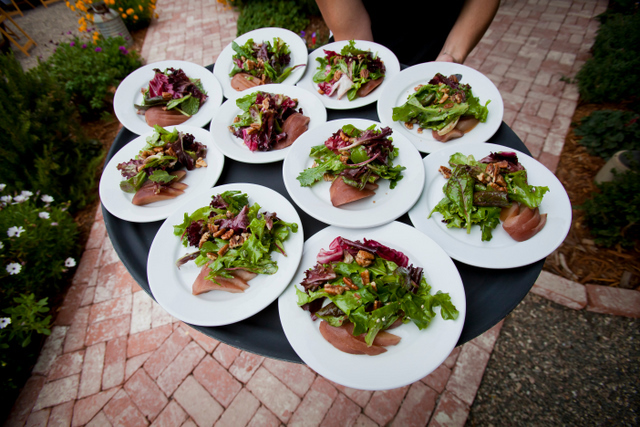 Guests started with a plated salad course of organix mixed greens with zinfandel-poached pear, gorgonzola, candied pecans & pomegranate vinaigrette. 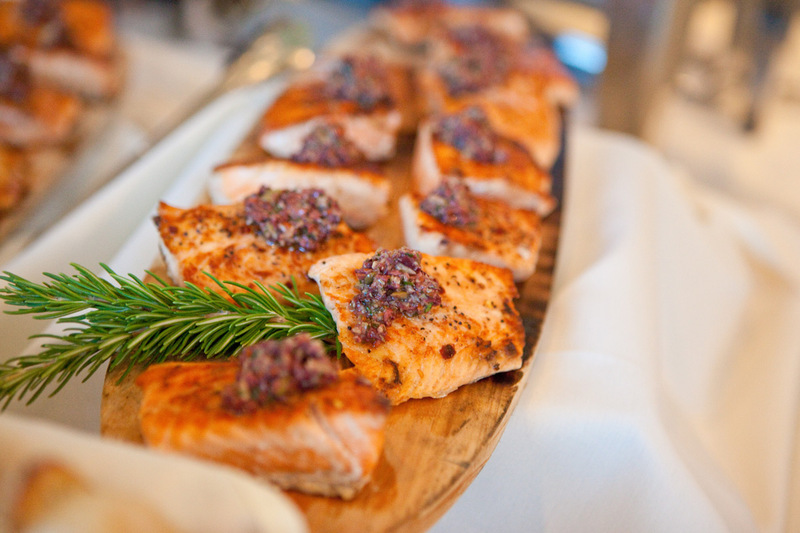 Then guests had a choice of aged top sirloin or pan-seared salmon. 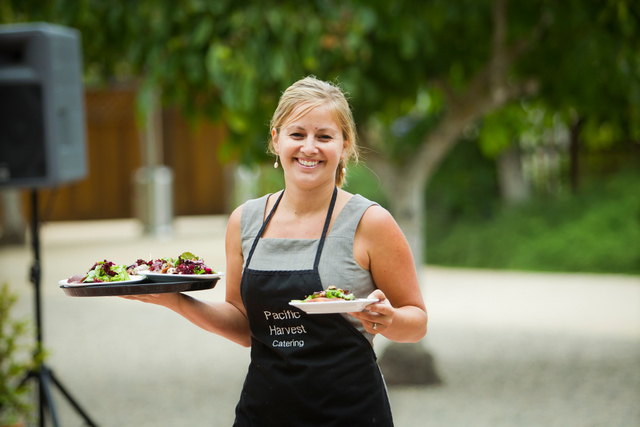 And finally, below are some shots of the awesome Pacific Harvest Catering crew at work! 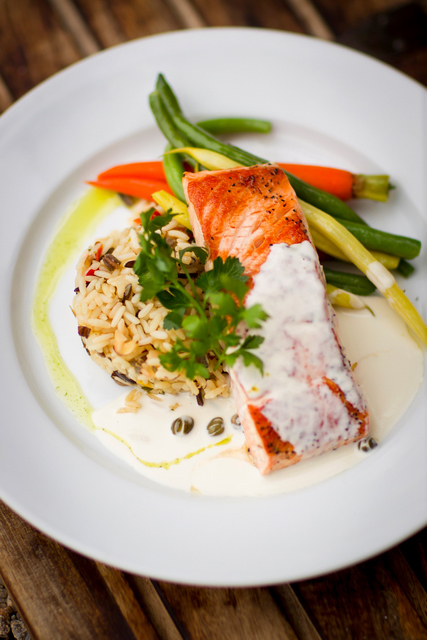 Among the praises we get from past clients, our staff is mentioned almost as much as the food. We are very proud of that! Leah & Linus are just one of the couples. So nice, so fun & just awesome together. From the moment we met them, we knew we couldn’t wait to be a part of their big day. 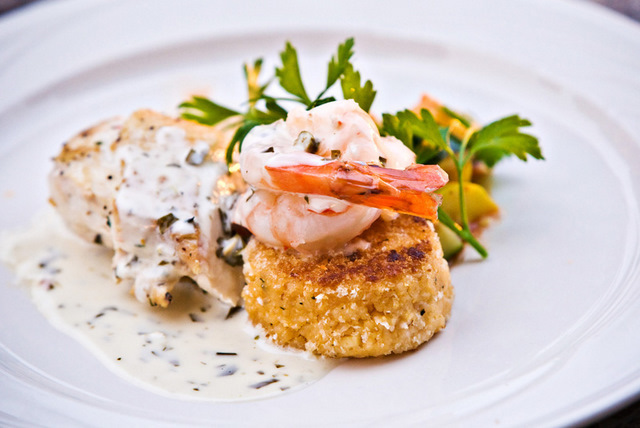 Their vision was to combine elegance & fun which we worked to depict in their menu below. 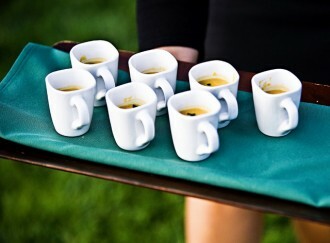 The demi cups below are filled with butternut squash bisque “shooters” with crispy sage & the other platter had assorted local sausages. Thanks to David Pascolla Photography for these beautiful photos. 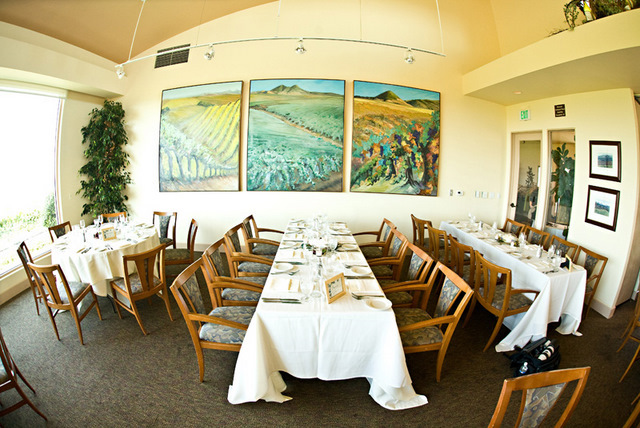 Edna Valley Vineyards is such a beautiful winery venue & one that we highly recommend as their staff is top notch. Kramer DJs rocked, as usual, creating an awesome dance party under the stars. In between dancing, guests enjoyed another delicious cake by The Cakery. 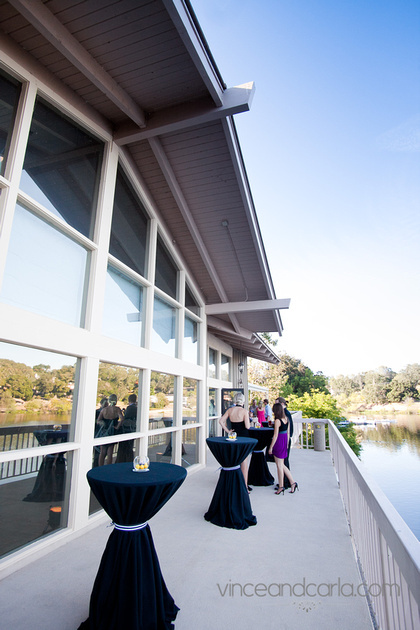 The Pavilion on the Lake is one of the most beautiful wedding venues on the Central Coast. Floor to ceiling windows frame the lakefront setting of a deck that drapes over the Atascadero Lake. The lovely couple, Jessica & Michael, knew they wanted the comforts of an indoor wedding reception while incorporating the beauty of the outdoors. 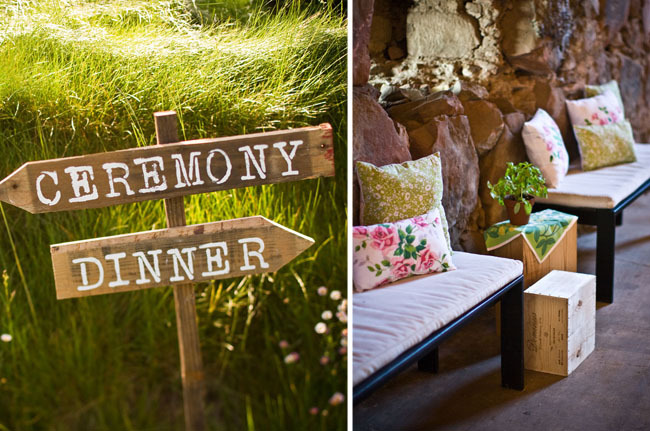 While outdoor weddings are popular & charming, indoor weddings eliminate the can-be issues of outdoor receptions…bad weather, bugs, unpleasant bathrooms, etc. 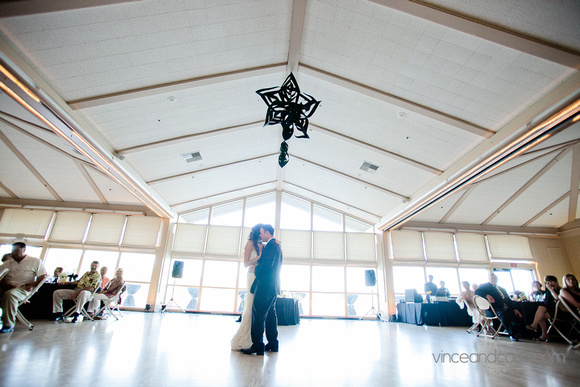 The Pavilion is one of the best places on the Central Coast to have an outdoor wedding & an indoor reception. And it’s smack inbetween Los Angeleas and San Francisco and minutes from the wine country! For their menu, Jessica & Michael knew they wanted a local rustic menu but with some elements that they love. For example, the couple included figs stuffed with gorgonzola & pancetta in their hor’deourves hour along with empanadas stuffed with pulled pork & topped while chipotle aioli. For dinner, they wanted their out-of-town guests to get a taste of San Luis Obispo County so they chose mesquite-grilled tri tip & herb-grilled chicken. 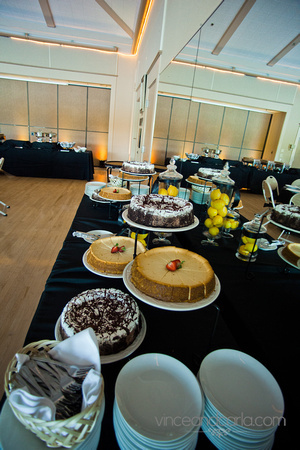 They also offered a dessert bar of chocolate decadence & cheesecake rather than a traditional wedding cake. Best wishes to Jessica & Michael as they start their new life together! 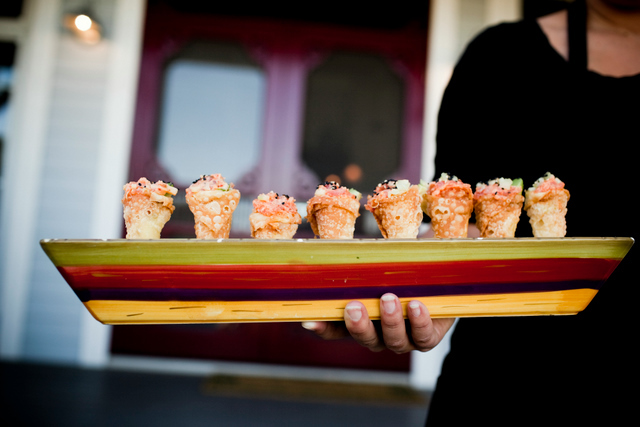 Our favorite weddings to cater are for the couples that welcome us into their lives to become their friends, and then as their caterers. Tommy & Rosanna were one such couple. They shared their vision and we listened. Then they let the chefs go crazy and create an amazing menu for them. Check out the Korean-style short ribs. 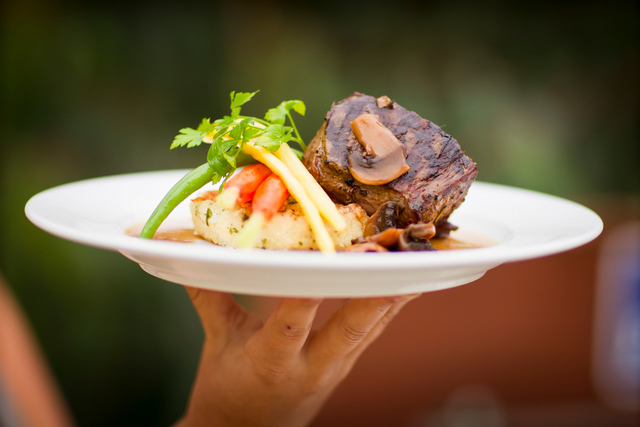 This picture was shot as the plate went out to one of the guests. Isn’t it beautiful? 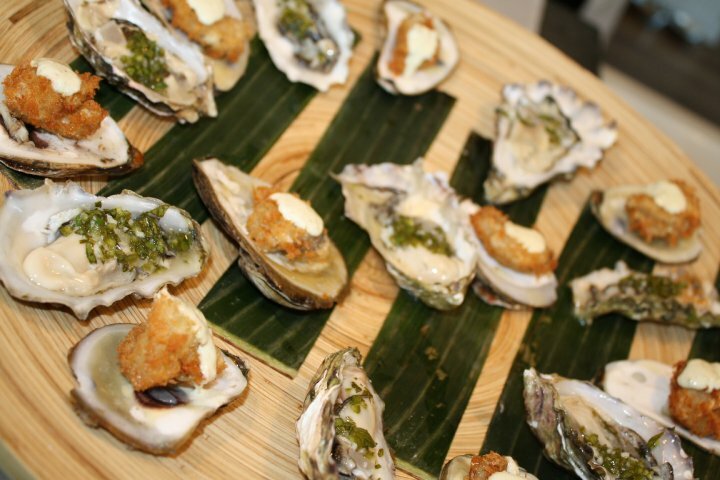 After the lovely ceremony at Venteux Vineyards, guests dined on fresh oysters, ahi tar tar & beef wellington bites paired with champagne. They then proceeded to taste wine & then enjoy the beautiful ambience created by Kramer Entertainment & Allure Events. 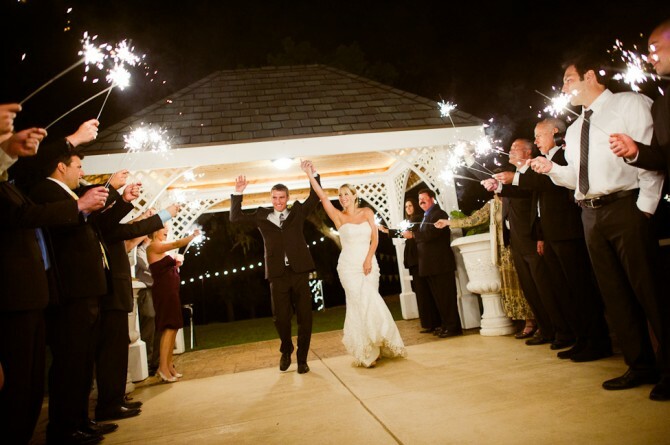 Thanks to Viera Photography for the beautiful photos & congrats to Tommy & Rosanna! 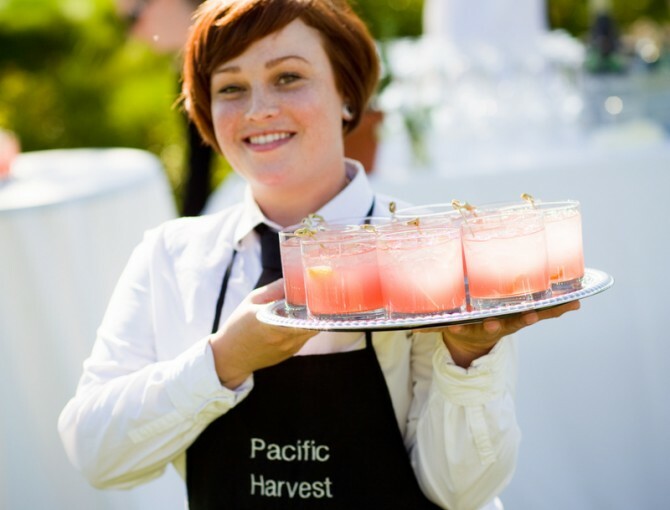 Pacific Harvest featured on Style Me Pretty blog! 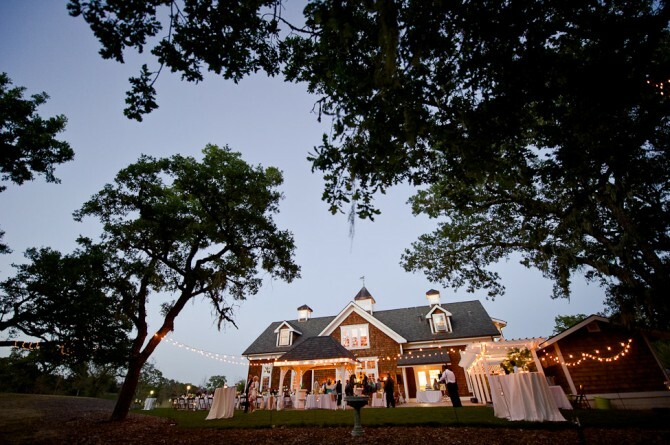 We had been meaning to post pictures sooner about Amber & Sean’s beautiful wedding we catered at Spanish oaks Ranch…but sometimes life just gets busy. Today, we noticed that Style Me Pretty, a popular national wedding web site had featured their lovely wedding! This wedding was all about rustic elegance from the setting, Spanish Oaks Ranch, to the flowers, the antiques, and of course, THE MENU! 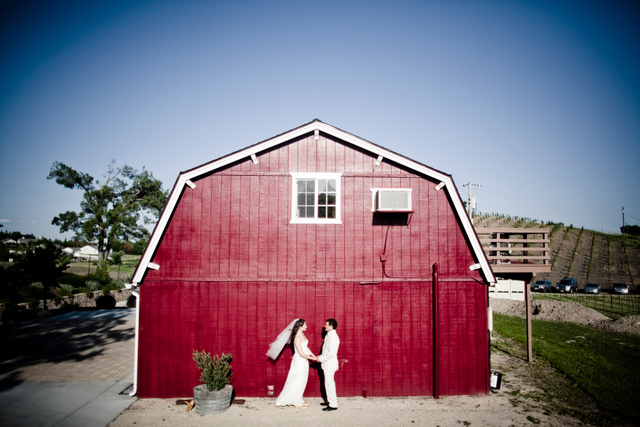 Spanish Oaks Ranch is a lovely wedding venue between San Luis Obispo and Paso Robles. Amber & Sean were so great to work with. 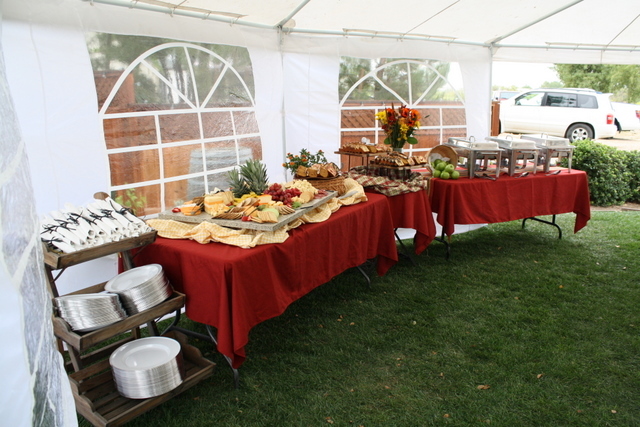 They were fun and laid back, and even came to a “back door” tasting at another event we were catering at Taft Ranch. I think seeing us in action and tasting the delicious oak-grilled tri tip sealed the deal for them. 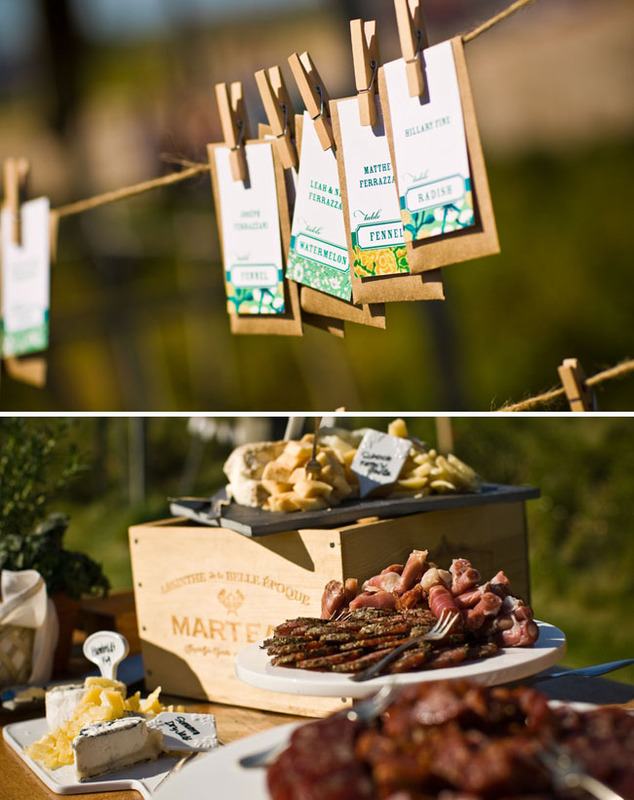 Their menu was ideal for the venue…a little bit rustic but all delicious. Thanks to Ken Kienow for the amazing photos which are seen here and on Style Me Pretty. Congrats to Amber & Sean! 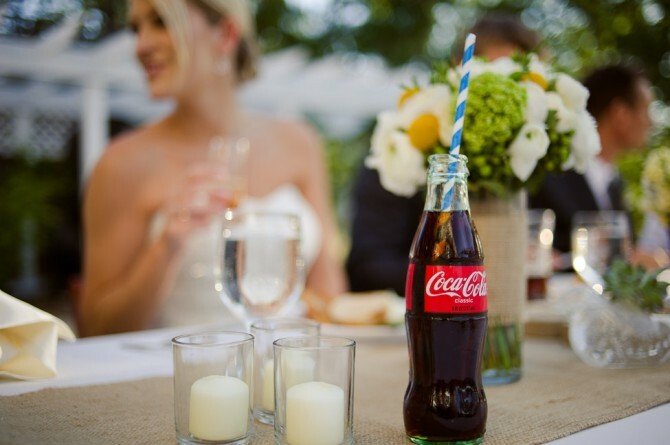 Thanks for letting us be a part of your special day. 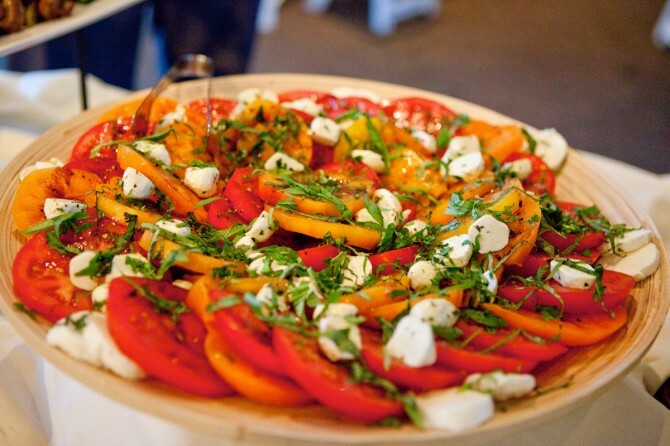 When we last posted photos from Leah & Neal’s fabulous wedding at Santa Margarita Ranch, we didn’t have access to all the photos that showcased the delicious food created that evening. That’s because as caterers, we’re busy making sure the food is fresh, tasty and beautifully presented so we rarely make time for photos. 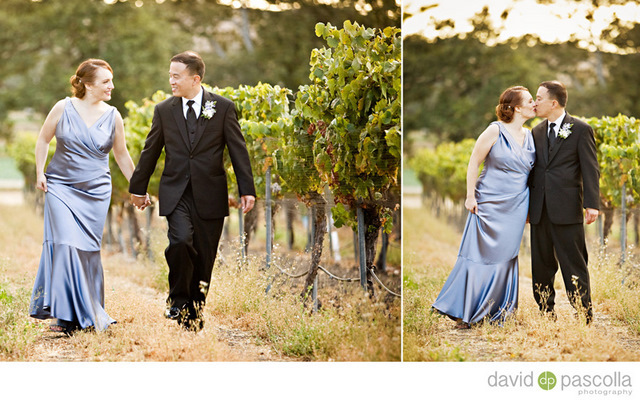 Thank goodness for Cameron Ingalls, an amazing San Luis Obispo wedding photographer. 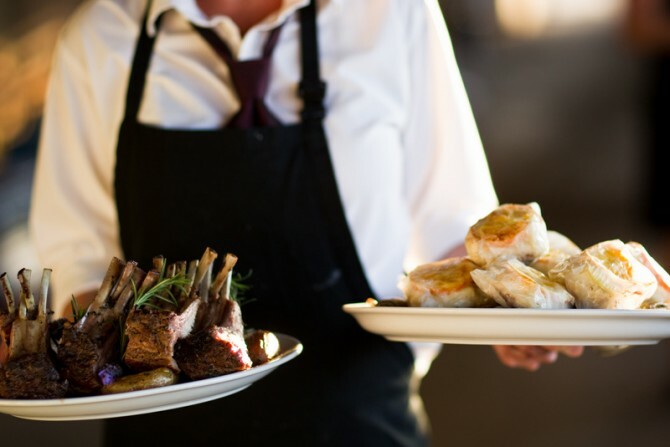 Leah, a food and wine writer, had a vision of local products from nearby farms to create an elegant dinner menu in the barn at Santa Margarita Ranch. So, that’s what we made happen. We visited our favorite farmers market at the Templeton Park and found awesome fava beans, purple baby artichokes, mixed greens, blackberries, and so on. The fava beans were pureed, mixed with herbs, garlic, & truffle oil and then spread on crostinis made from Hush Harbor artisan breads. 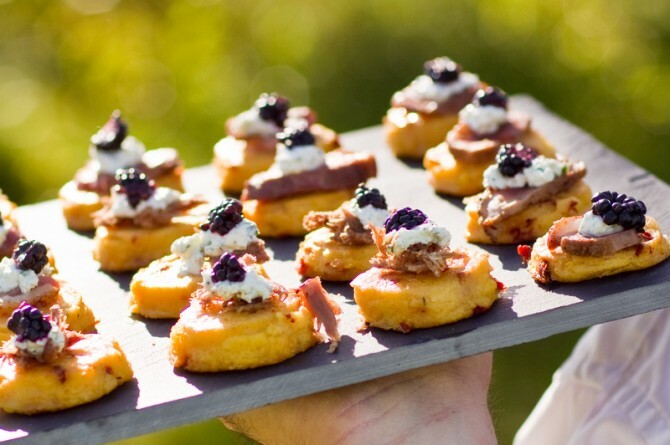 For a more exotic appetizer, we paired duck confit with grilled sundried tomato polenta cakes, blackberries and herbed goat cheese. 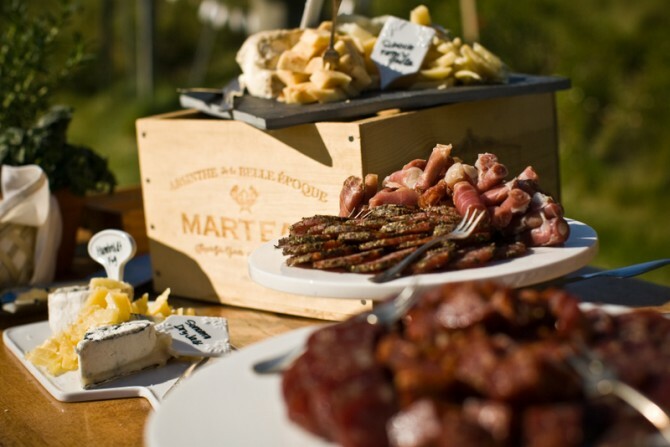 And to stay true to the classic hor dourves, we did a spread of charcuterie that included local artisan cheeses, sliced cured meats, duck sausage, and pates. 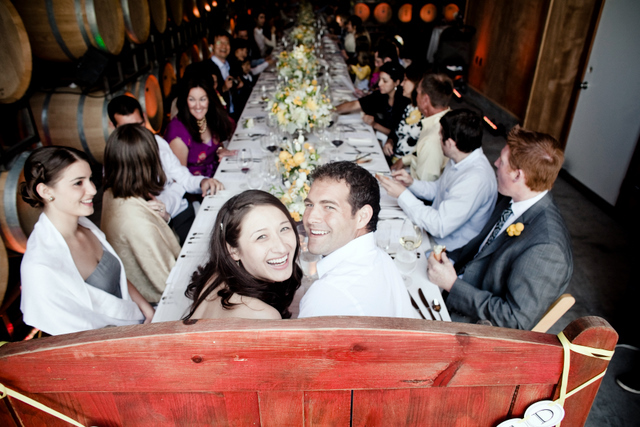 We love our brides & grooms that make our job so fun. Thanks Leah & Neal for loving food as much as we do! 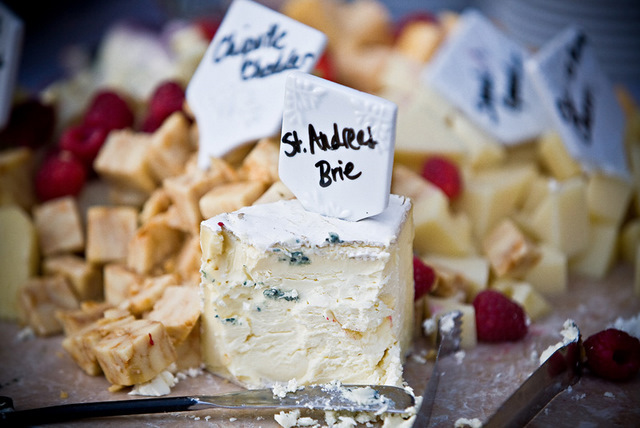 To see the bride’s food and wine blog, please click here and for more details on the wedding, see the blog below! PHC featured on Green Wedding Shoes blog! 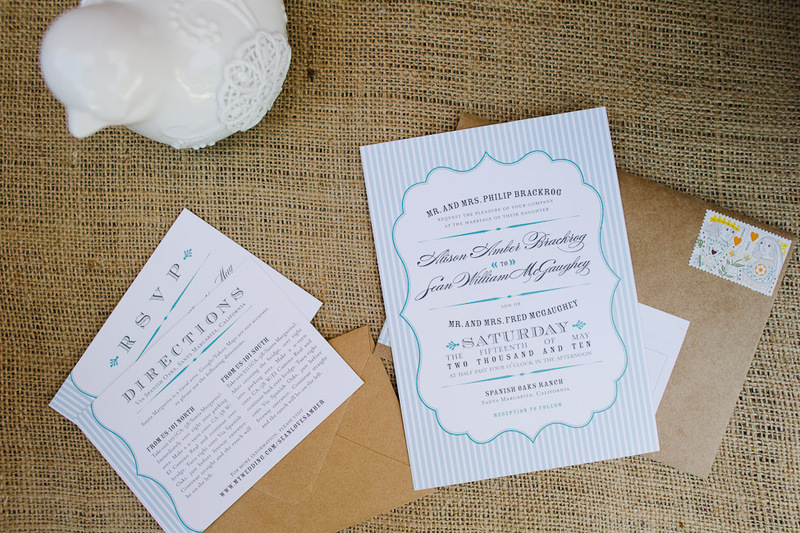 We are honored today to be featured in a popular wedding blog for the modern bride! 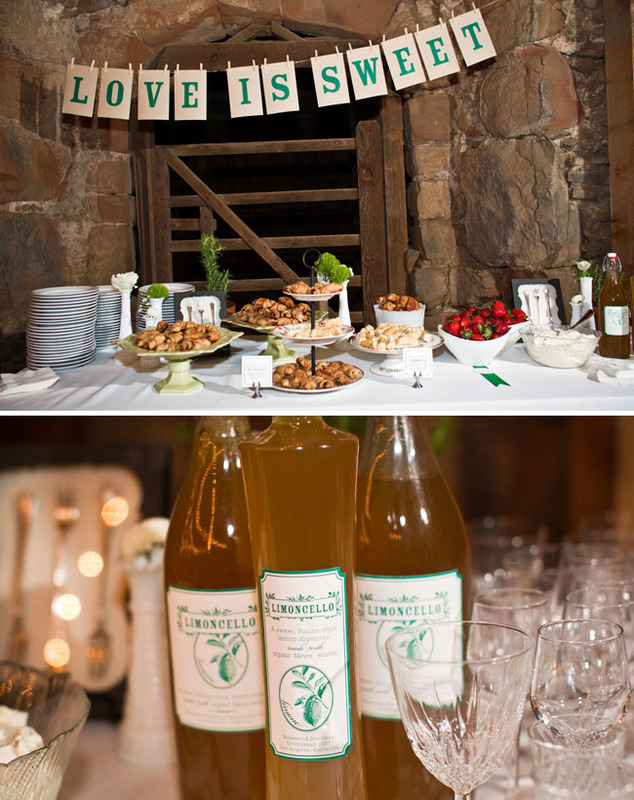 Green Wedding Shoes features the recent wedding of Leah & Neal at Santa Margarita Ranch. 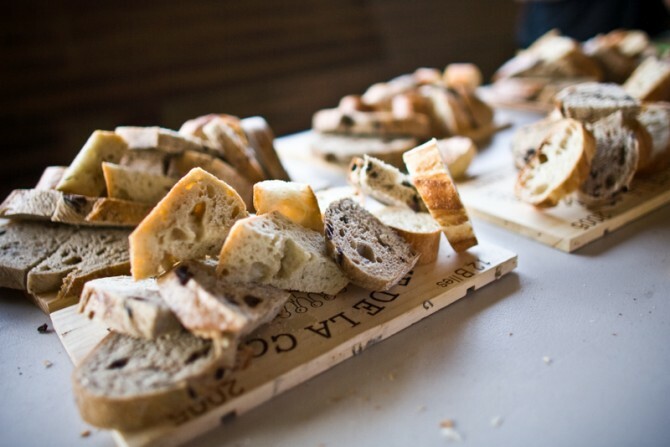 Leah, a food & wine writer, had a vision of creating a rustic dinner party with most of the meal served family-style. 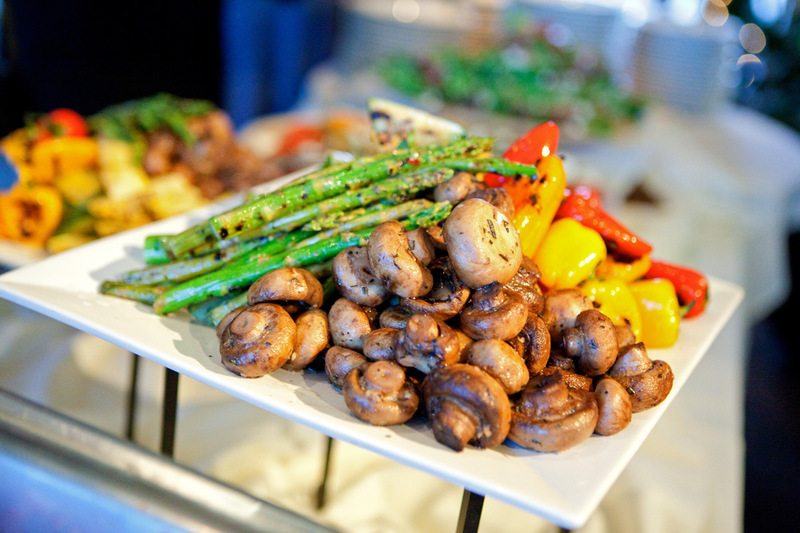 Guests dined on arugula salad with roasted red pepper vinaigrette, fennel & tangerine salad, tortellini en brodo, and rack of lamb and halibut served with sauteed baby artichokes & grilled farmers market vegetables. 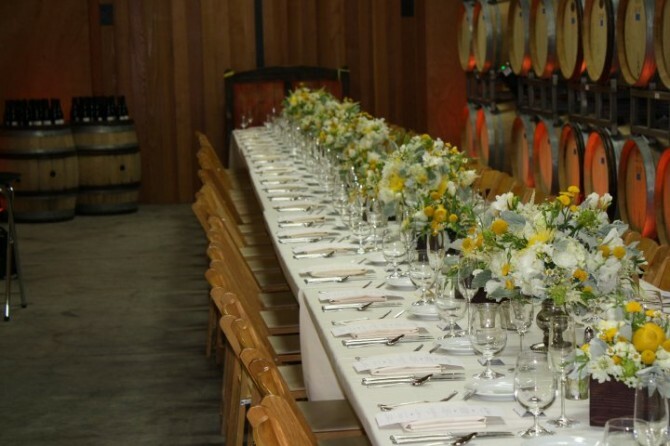 Leah handpicked the wine that was paired with each course to give her guests the ultimate wine-pairing dinner experience. 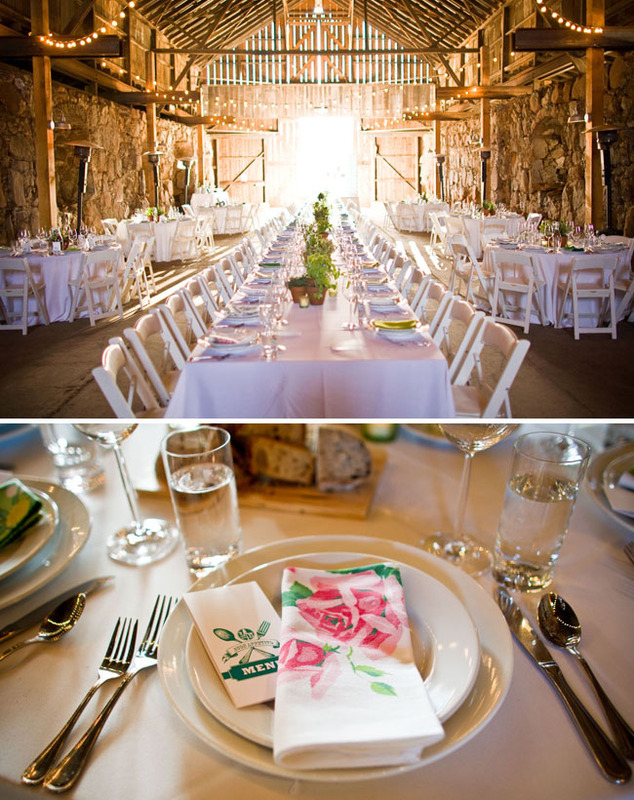 With the amazing ambience of Santa Margarita Ranch, it was an incomparable setting for a wedding reception. Cameron Ingalls is responsible for the amazing photos and Emily Kelly took care of all the incredible details as the wedding planner. Check out the write-up here! 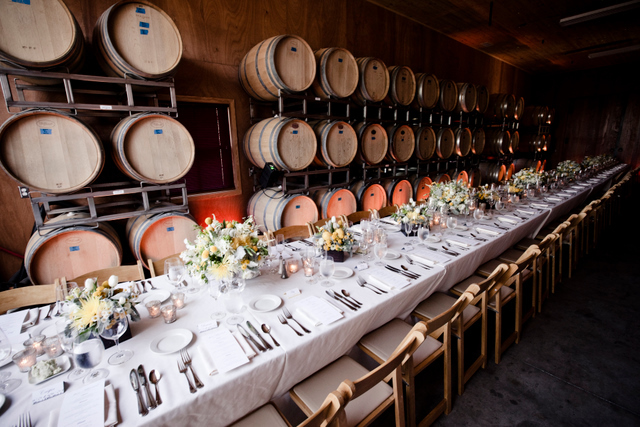 We cater so many weddings each year in the wine country of San Luis Obispo and Paso Robles but some weddings are more memorable than others. 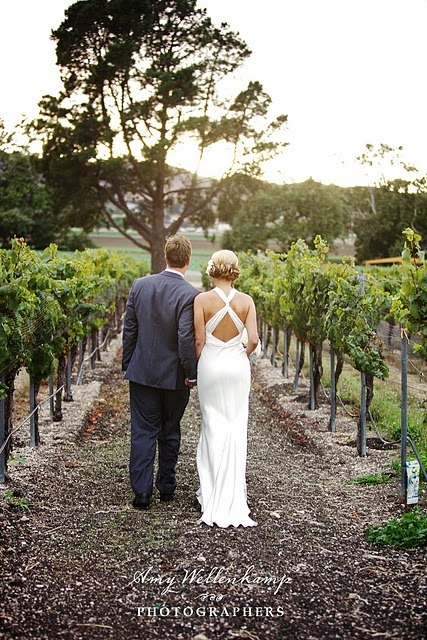 Tommy & Rosanna’s wedding at Venteux Vineyards was one such wedding. The couple walked down the aisle together holding hands and were so amazing to work with throughout the whole process. We are grateful they let us be a part of their big day. Now, for the fun part–the menu! Guests dined on oysters & champagne shortly after the happy couple said “I Do.” Then the cocktail hour continued in the the winery tasting room where tray-passed mini beef wellingtons and ahi tar tar circulated. Once it was time for dinner, guests dined on a salad of mixed greens with gorgonzola, Zinfandel-poached pear, candied pecan & pomegranate vinaigrette. 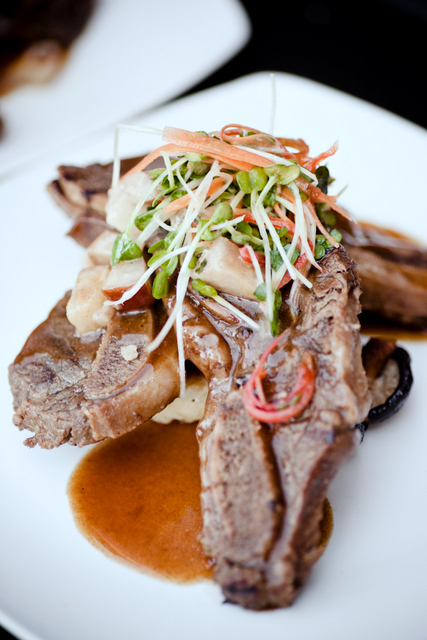 Entrees included Kalbi-style short ribs and Kurabuta pork chop served with risotto cake & market fresh vegetables. 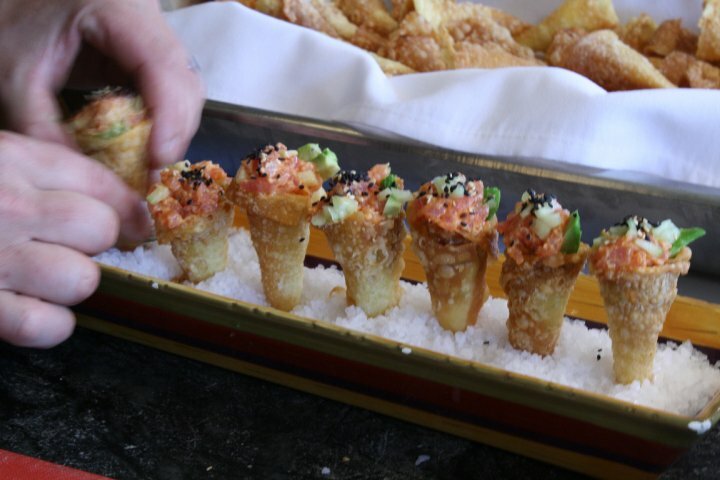 The couple asked for “rustic winery cuisine which incorporates Asian fusion” which is how the chefs came up with this amazing menu.